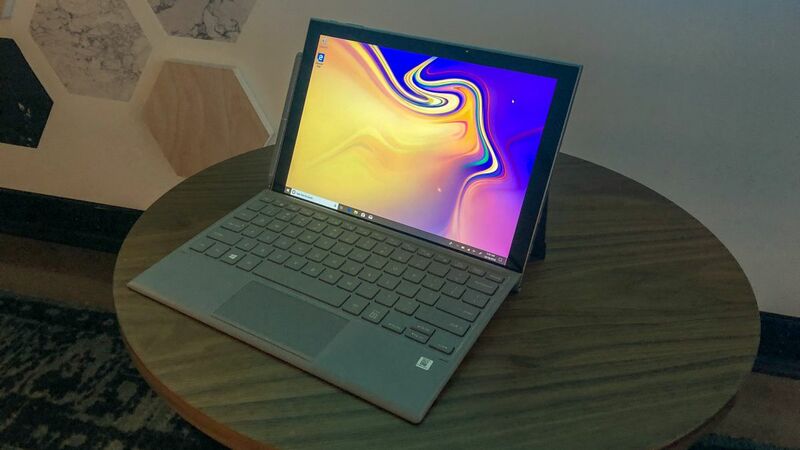 The successor to Samsung’s take on the Windows tablet is here: the Samsung Galaxy Book 2, and it’s got a new friend under the hood – a Qualcomm processor. The two companies made the announcement during an in-depth panel discussion in New York City. Of course, the Galaxy Book 2’s marquee feature is LTE connectivity through the modem within Qualcomm’s Snapdragon 850 system on a chip, or SoC. However, another major point for this 2-in-1 tablet is that the essential stylus and keyboard cover accessories come in the box. That box filled with the complete product, you might be wondering, will cost $999 (about £757, AU$1,399) in the US when it launches on November 2 on AT&T, Microsoft and Samsung’s online stores. The tablet is also going straight to AT&T, Sprint and Verizon stores later this month. Naturally, you’ll need a data plan from one of these carriers if you want that connectivity anywhere. This is an awfully impressive price given what appears to be on offer on paper, if only for including those arguably crucial accessories. Previous iterations of the Galaxy Book, or Samsung Windows tablets like it, went against the trend of kickstand designs in lieu of ones that rely more on the keyboard for its various modes of use. Now, the Galaxy Book 2 has gotten in line with the overwhelming majority in its design. This may make the Galaxy Book 2 a bit less unique in its look and feel, but it may well have been a worthy decision given feedback on previous models provided by many, including yours truly. As for the tablet’s speeds and feeds, you’re of course looking at a Qualcomm Snapdragon 850 SoC backed up by 4GB of memory and 128GB of solid-state storage. This all sits behind a 12-inch Super AMOLED display with a 2,160 x 1,440-pixel resolution. Samsung and Qualcomm promise a battery life of up to 20 hours from the tablet. However, this number was achieved using Windows 10 in S Mode, which the tablet ships with. On the outside, the tablet sports two USB-C 3.1 ports, a microSD card reader and a headphone jack. Of course, Qualcomm’s struggles with launching its computing platform are well documented, so only a full review will tell whether this is the product to turn things around for it.